To drill or not to drill? In recent years, many people in western North Dakota have grappled with that question. One of the groups faced with this decision was Three Affiliated Tribes — the Mandan, Hidatsa, and Arikara Nation. Journalist Todd Melby chronicled their story for "Black Gold Boom," a documentary that will premiere this weekend on TPT. Ultimately, the tribe decided to form their own oil company. "They thought if they formed their own oil company, they would get more of the funds they could spend on things like healthcare and education and things for their members," Melby said. This summer, they drilled four wells. Melby joined MPR News' Tom Weber to discuss his film and the tribe's decision. They were joined by tribal member Marty Young Bear, who appears in the documentary. When asked how the community of New Town has changed since the tribe began drilling, Young Bear said he's seen both good and bad. "It's like any other place that's had the oil boom," Young Bear said. "Lot of crime, lot of different people coming in, lot of jobs, more housing, higher prices — so a lot of change. A lot of negative change but a lot of positive change too, as far as opportunity for our tribe to better ourselves." "But at the same time, it's putting our environment in danger. Our people, we believe it's better for us to think 40 years down the road about our lands. They say don't take more than you need from the land because you're going to hurt yourself." 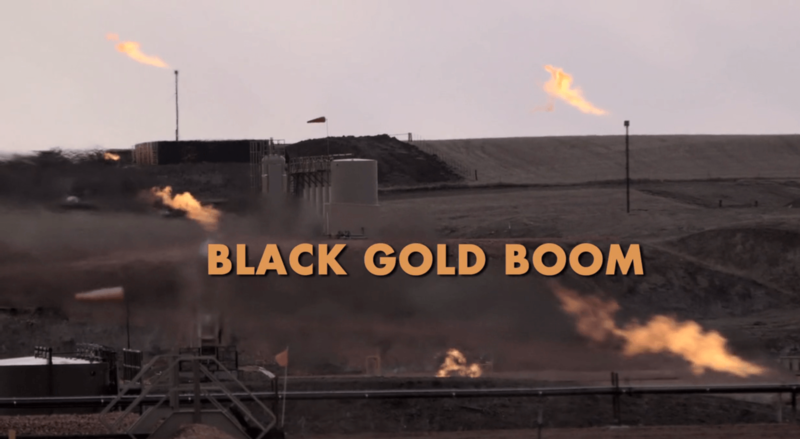 "Black Gold Boom" premieres Nov. 8 at 10:30 p.m. on TPT. To hear the full discussion about the tribe's decision to drill in North Dakota and the "Black Gold Boom" documentary, use the audio player above.